I started lifting during my junior year of high school while I ran cross country and track and field. I wanted to improve my performance, so my track coach introduced me to the weight room. I grew to love the gym and made significant improvements on the track and in life. I put on size quickly and saw rapid changes in my body. I used to hear stories about lifting stunting growth, so I was hesitant to start. I would watch others at first, but I eventually built up courage and entered the gym arena. After attaining enough training knowledge, I started working out and my perception changed. I enjoyed the challenge just as much as the changes to my physique. I saw it as a battle against myself to push my body to its limits. "Following my injury, I bounced back stronger than ever and built a plan that worked for my body. I currently weigh 200 pounds, am a signed fitness model, and a NPC physique competitor." A year later, I was 5-foot-10 and 165 pounds as a high school senior. Then I fractured my wrist in a freak accident and had a screw inserted into my scaphoid. I was devastated and couldn&apos;t work out for 16 weeks, so I focused on running and became the Staten Island 55-meter hurdle champion. Following my injury, I bounced back stronger than ever and built a plan that worked for my body. I currently weigh 200 pounds, am a signed fitness model, and a NPC physique competitor. Years ago, I never would&apos;ve seen myself accomplish what I have, but these new experiences have kept my life interesting. I&apos;m not a believer in taking rest days unless my body tells me to. My cardio of choice is running in the afternoon. I keep my mileage around 20 miles per week within a four-day span. Cardio is the key to stay lean and shredded. I prefer a high-protein, high-fat, and low-carb diet to stay lean year round. I&apos;ve seen good results from this dieting method, but it&apos;s not for everyone. My goal is to consume 1-1.5 grams of protein per pound of bodyweight daily. "Participating in athletics taught me about weight training to enhance my performance." My passion for fitness emerged during my junior year of high school when I ran cross country and track and played baseball, basketball, and football. Participating in athletics taught me about weight training to enhance my performance. The biggest motivator was myself. As I saw results, success made me want to work harder to be the best. I look to myself for inspiration. I wake up every day to become better than I was the day before. I always stay hungry and visualize becoming successful. I plan to obtain my personal trainer license this year so I can train others and share my knowledge to transform lives. On a larger scale, I plan to become a nationally-recognized fitness model and physique competitor. Don&apos;t get caught up on rep ranges and weight. Go until failure on every set. Find what works for you and always be open to new ideas. Everybody has a take on what it means to be successful in bodybuilding. Use new ideas to create a unique program. Find out what works for you and you&apos;ll be on the path to success. Rob Riches is my favorite competitor. 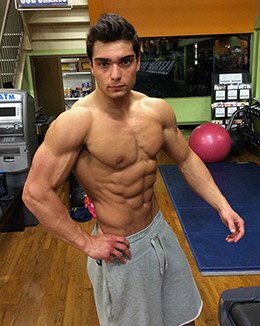 I order every supplement from Bodybuilding.com and read the articles to gain knowledge about fitness. Oleg Fought For New Muscle! What happens when an unstoppable force of intensity hits the weightroom? You get Oleg Laptsevich! Uncover the training methods he used to build a fortified physique! Daniel Fought Injury With Iron! Hip degeneration and labral tears ripped basketball from Daniel&apos;s life, but he didn&apos;t give in to injury. See how this teen battled back and lifted heavy iron to build a powerful physique!